This ultra-dry, flexible-hold hair spray provides lasting humidity-resistant style support while combating the aging process. The spray features Age-Control Complex® to address natural, chemical and environmental aging. It's infused with the 3 Cs—caviar extract, vitamin C and cytokines to help smooth the hair shaft and increase shine. Color Hold® locks in hair color brightness and Enzymetherapy® helps transform ingredients into a micro structure that hair can more easily absorb allowing for deeper, targeted penetration of active ingredients. Directions: Style hair as desired. Hold can 6-12 inches away from hair and spray. For a softer look, brush through when dry damp hair and style as desired. As an oil treatment, apply liberally to dry hair & leave on for 10 minutes then wash your hair as usual. Information provided by Alterna. 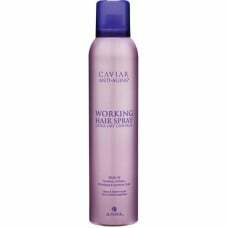 Model: Working hair spray 211 g/7.4 oz. fl.